4. a tangential part, resembling the volute of a snail's shell, that collects the fluids emerging from the periphery of a turbine, impeller pump, etc. 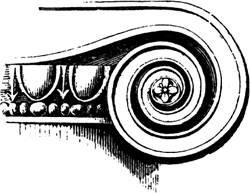 A spiral, scroll-like ornament having a twisted or rolled shape, found most often on the capital of the Ionic column. A spiral casing for a centrifugal pump or a fan designed so that speed will be converted to pressure without shock. Total enthalpy is assumed to be constant from the impeller exit to the volute exit, while total pressure is allowed to rise. These interfaces were applied where the domains of the impeller and the inlet region are connected, as well as where the volute and the impeller are connected. The Corinthian capital has typically two distinct rows of acanthus leaves above which appear eight fluted sheaths, from each of which spring two helices, of which one curls beneath a corner of the abacus as half of a volute and the other curls beneath the center of the abacus. Most unusual, though, was the signature of a woman under several lines of Latin text engraved beneath the image, explicitly dedicating it to students of architecture: "This volute from an ancient capital of a Numidian stone column of the composite order, in St. Most centrifugal pumps are the volute type, in which the impeller discharges into a progressively expanding spiral casing. The ERI AquaSpire high-pressure single-stage seawater or brackish water pump contains ERI's patented Volute Insert Technology[TM], which allows the custom hydraulics of the pump to be adjusted should the system conditions change in the future, such as plant expansions. This concerns both, the Newtonian and Non Newtonian fluid flow in the volute of the pump. A hardened castiron volute effectively withstands suspended particles and small solids sucked through the strainer, while an abrasion-resistant, castiron three-blade impeller and a replaceable wear plate ensure long life and low maintenance. The pump incorporates the successful expanded offset volute and single port impeller which is specifically designed to handle tile most delicate of food products with the minimum of damage demanded by high volume vegetable manufacturers. It includes both volute and nonvolute designs, with a patented Zero Dead-Leg casing drain and internal seal flushing.